Open to healthcare providers and to the general public. Get your Basic Life Support (BLS) Training and Advanced Cardiac Life Support (ACLS) Training in DMMC. 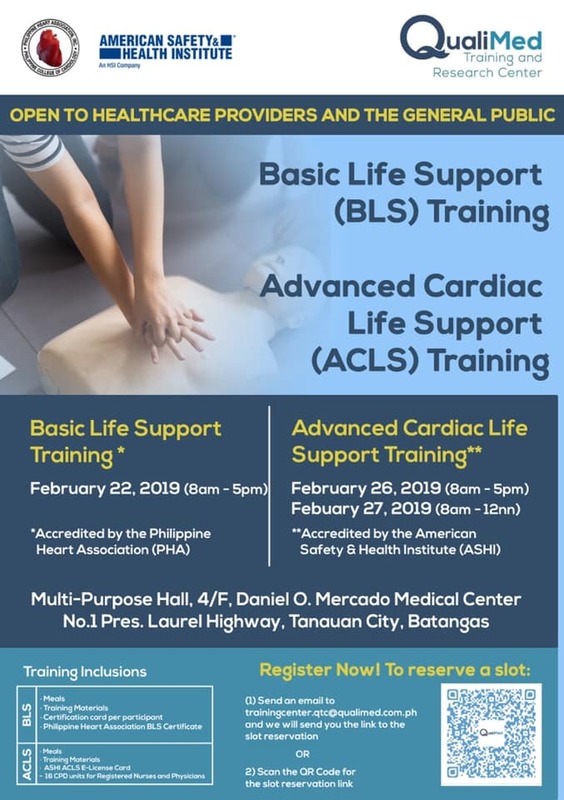 The BLS Training is on February 22, 2019 (8am – 5pm). Training inclusions: meals, training manuals, certification card per participant, and Philippine Heart Association BLS Certificate. This is accredited by the Philippine Heart Association (PHA). The ACLS Training is on February 26 (8am-5pm) and 27 (8am-12nn), 2019. Training inclusions: meals, training materials, ASHI ACLS E-license Card, 10 CPD units for Registered Nurses and Physicians. This is accredited by the American Safety & Health Institute (ASHI). Register now to reserve a slot! Send an email to trainingcenter.qtc@qualimed.com.ph.